In our Questions series, we’re confronting life’s biggest questions. From the why to the what and everything in between. In doing so we discover God’s faithfulness, God’s perfect timing and God’s purpose for our lives. We may not have all of the life’s answers but we can look to him who does even when life doesn’t make sense. 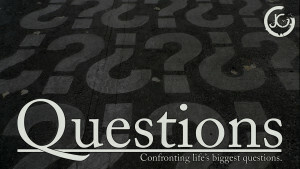 In the fourth message of our “Questions” series, Pastor Paul explores the “what” of life. In the third message of our, Questions, series, Pastor Paul explores the “who” of life. In the second message of our, Questions, series Pastor Paul explores the “when” of life. We all are in a hurry and expect God to respond to our time frame. In this message, we discover God is always on time, never too late and never too early. In the first message of our, Questions, series Pastor Paul explores the “why” of life. We all want to know why things happen but in the end, we must simply put our trust in our good, good Heavenly Father and believe that he has our very best interest in mind.